O.D. clamping with Ø 400 mm? Even this is no problem with SPANNTOP. 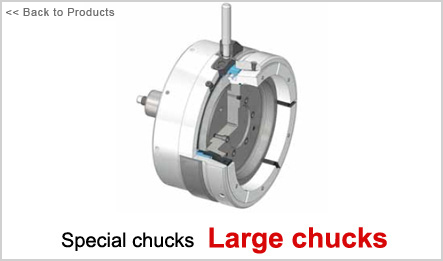 Yet at such sizes our experts rely on the proven clamping head/chuck solution. Naturally the change is just as convenient as you have come to expect from SPANNTOP. Clamping head and associated work piece end-stop have a bayonet connection, for example: with a vertical machine the chuck moves over the clamping head and end-stop from above to actuate the chuck bayonet via a separate hand lever that locks the head and end-stop in the chuck. Move the chuck upward, tighten the mounting screws of the stop, that‘s it. Speedy set-up – at top concentricity values! The solid SPANNTOP chuck offers convincing performance with unbelievable rigidity and precision and is therefore perfect to machine hard bearing rings. The solid SPANNTOP chuck offers convincing performance with unbelievable stiffness and precision and therefore is perfect to machine hard bearing rings, for example.